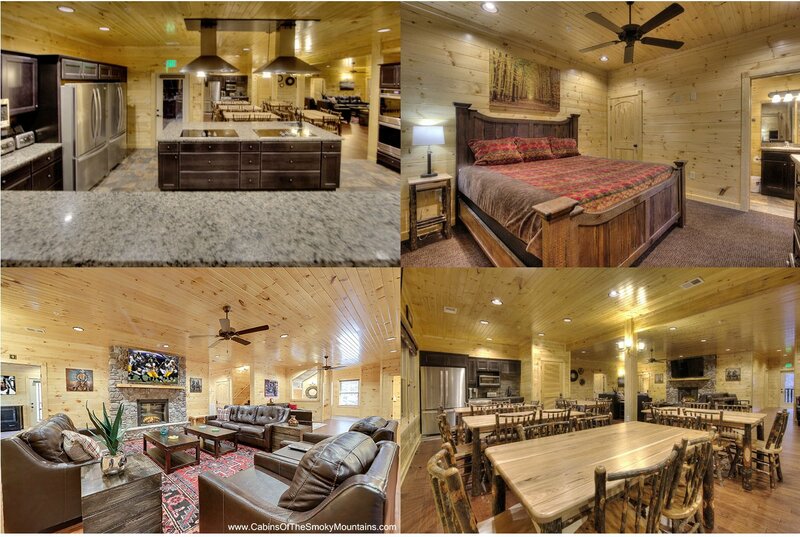 What would you do with a luxury cabin in the Smoky Mountains that had 20 bedrooms? Well, if you were a group of 60 people, you’d just move in and enjoy your stay! Welcome to the Gatlinburg Lodge, one of the largest rental cabins in the Smoky Mountains. 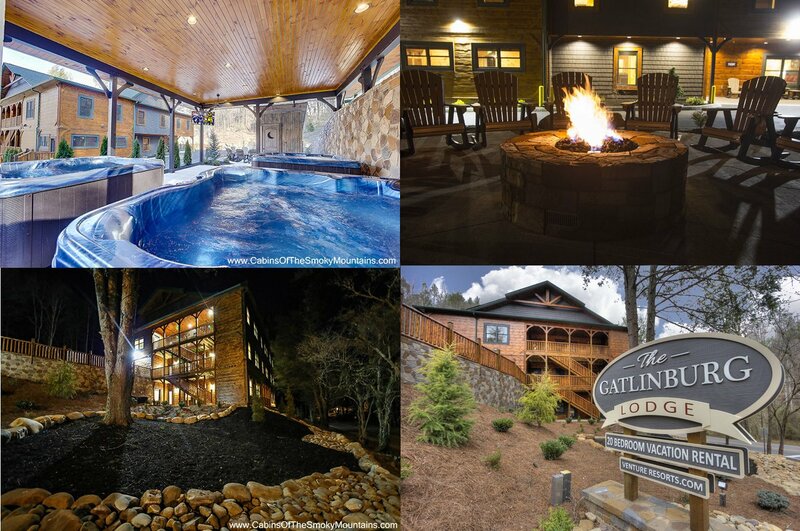 Weighing in at 10,000 square feet, the Gatlinburg Lodge is a perfect venue for a business retreat or a family gathering. The Lodge has 20 bedrooms with 20 full, en-suite bathrooms. Built at a cost of $2.5 million, the Lodge offers creatively designed places to come together and nooks and crannies everywhere to be separate. The communal dining area has several solid wood tables and multiple dining places able to feed 50 people at a time, and served by a luxury kitchen with two stove tops and four ovens! Further out in the living area are comfortable chairs and couches to relax and gather in earnest conversation. The Lodge has access to the resort fitness center to work up a sweat, and its own spacious laundry room with two large-capacity washers and dryers to stay laundered. The resort swimming pool and wedding facility are also included in the Lodge hospitality. Three grand-scale hot tubs in a covered pavilion offer some outside luxury, while 20 rocking chairs and a large gas fire pit offer ways to sit in small or large gatherings. There’s a charcoal grill and picnic table for another way to celebrate. Indoors, the home theater with theater seating offers more communal fun, while the pool table and arcade games in the loft area game room ramp up the friendly competition. Multiple large flat screen TVs abound throughout the Lodge – including in the hot tub pavilion – with streaming movies and premium cable. There are Blu-ray players, sound systems, and even a Rush Driving Simulator. A wet bar with bar fridge offers refreshment for the adults while the kids marvel at their custom-designed bunk rooms. There’s WiFi throughout the Lodge, and free long distance phone calls are another useful convenience. The Gatlinburg Lodge is main floor wheelchair accessible, and served by a flat parking area large enough to park 3 tour buses. The Lodge is located within the city limits of Gatlinburg, in the mountains but with no hills or mountain roads to navigate. As millions of visitors to the Smoky Mountains know, cabin living at any scale is the best way to enjoys a stay in the mountains, from romantic getaways for a couple to larger friend and family gatherings. Multiple decks and levels offer the perfect mix of privacy and sociability, while the mountain air and ambience is all around. Many people find it hard to leave the cabin, with all the conveniences of home, even with all the attractions outside in Gatlinburg and Pigeon Forge, and America’s most visited national park, Great Smoky Mountains National Park. The Gatlinburg Lodge can be available at discounted rates just like any other cabin, during our many Specials that occur – including Half Price dates on available cabins. Check our Specials page for current deals. Follow this link to view or book The Gatlinburg Lodge online, and for more information call us any time at 855-91-SMOKY. And remember, no matter which town you choose for your destination, we have cabins across the whole area to suit your stay. Choose from our Pigeon Forge cabins, our Gatlinburg cabin rentals, and our Wears Valley cabins. Everywhere around here is pretty close to anywhere you want to be. An Eagle’s View Rental Cabin – Best View of the Smoky Mountains?